Well, this is my first ‘proper’ Random Recipe for Dom at Belleau Kitchen. I missed the deadline for August (I am new to this after all) so thought I would get in there early for number 20! 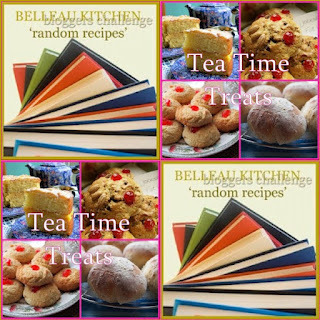 In July he asked people to submit pics of their cookbooks (although mine’s are mostly magazines, they were allowed!). Preheat your oven to 180oC. Spray a 13”x9” baking pan with baking spray, line the bottom with baking paper, spray again then coat in flour. Nothing sticks this way. In a mixer combine the melted butter, plus all the other crumb ingredients and mix until it becomes crumbly looking. Set aside. For the cake, whisk together the flour, bicarb, baking powder and salt. In another bowl, cream the butter and caster sugar together for about 6 minutes, then add the vanilla and eggs, one at a time. Now add your flour in three lots to the butter/sugar/egg mix, adding half the sour cream between each flour addition. Mix until just combined. Spoon the thick batter into the prepared pan, coaxing it with a spatula (it is very thick!!). Now crumble the crumb topping onto the top of the batter. Big and small crumbs are the order of the day here. Pat these gently into the batter and then pop the pan into the oven. The book says for 45 to 60 minutes. A skewer came out of mine’s clean at 45 minutes, but results will probably vary. I left mine to cool over night. I sprinkled mine with some icing sugar, then sliced it into 24 bars, but realised that the 24 pieces were HUGE and cut each one in half, so yielded about 48 pieces. If you like it bigger, stick to 24! 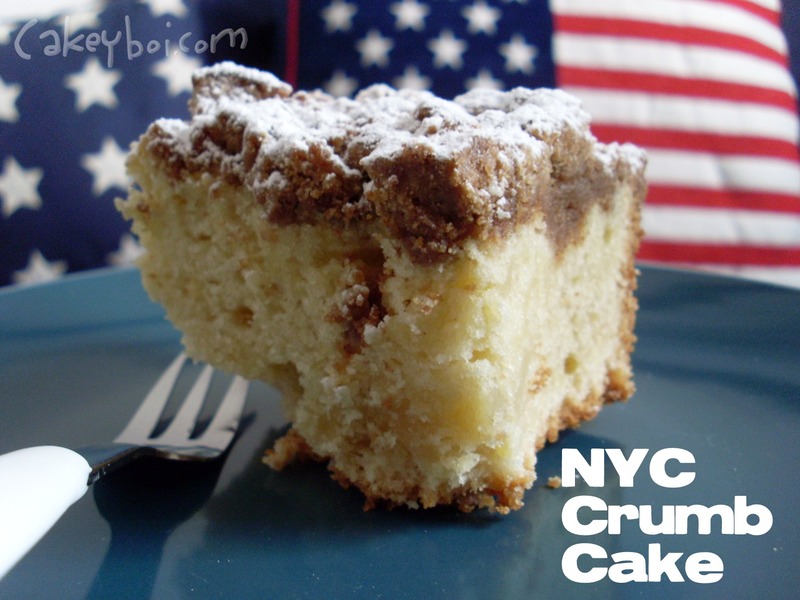 The cake is moist and light, and the crumb topping, is sweet and spicy with the cinnamon, and almost cookie like. You will enjoy!! Thanks Karen - it went very quickly, else I'd mail you some lol! You should show us your magazines anyway Stuart, I like a bit of a nosy at other people's books and mags, I'm sure other people would look too. What a great crumble crumb topping, I don't think I've seen anything like that before. Thanks Janice - it was well lush!! This looks delicious and I can speak with some authority on the subject, as you know! ; ) I would have a great chunk of this cake with a steaming mug of black coffee! Actually, I wish I COULD have a great chunk with a mug of coffee! I love crumb cake; it's actually one of my favorite treats. Yours looks great! It is good Laura, isn't it? I think it's the cinnamon that does it for me!! Thanks Gem - I am jealous needless to say ;) but I really hope your move goes well and I hope to hear from you soon and see what north American inspiration you can provide - keep in touch! This looks like it has some fascinating textures going on. That's a serious amount of cinnamon. Beautiful crumb cake! I often do fruit crumbles but I forget about their sister, the coffeecake with crumble. Thanks for the reminder and this wonderful recipe. That looks fantastic - the crumb topping sounds absolutely delicious - yum!